Atlanta’s leading luxury agent, Debra Johnston, lists the ultimate secluded sanctuary and one of the most exquisite examples of Art Deco mastery in the exclusive Winterthur Estates, nestled at the end of a cul-de-sac and ensconced in the grounds of a lush 7-acre domain. 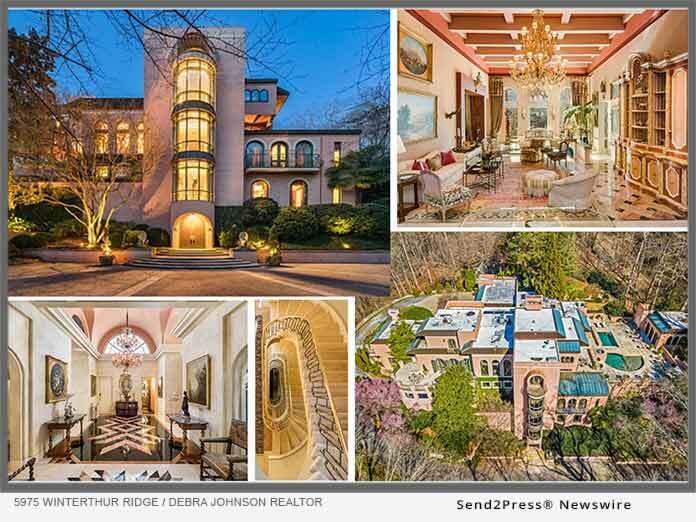 ATLANTA, Ga. /Mortgage and Finance News/ — Atlanta’s leading luxury agent, Debra Johnston, lists the ultimate secluded sanctuary and one of the most exquisite examples of Art Deco mastery. In the exclusive Winterthur Estates, nestled at the end of a cul-de-sac and ensconced in the grounds of a lush 7-acre domain, this rare offering boasts seven bedrooms, 8 full baths, 5 half baths, as well as 17-20 foot ceilings, an abundance of flawless marble finishes, an elevator, wine cellar, theater, pool house plus heated pool and even caters to guests with a fully equipped second floor apartment.